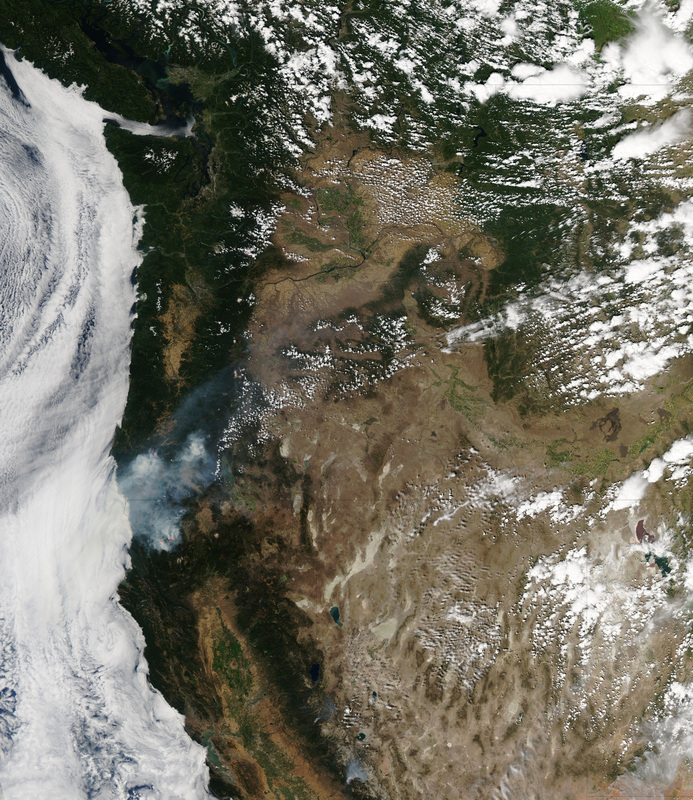 Huge wildfires, aggravated by a bad drought, are sending acrid clouds of smoke into nearby cities. This example of "extreme fire behavior" (to use the forestry department's words) went down in the Douglas Complex wildfire, one of several conflagrations turning conifers to cinders in southern Oregon. The intensity of fires in this sector of the country, which is locked in a stubborn drought, is strong enough that nearby towns and cities are getting covered with big, lung-painting plumes of ashy air. On Tuesday evening, the state's environmental department noted that the area around Medford (metropolitan population: 207,000) had an "unhealthy" air quality index of 151, meaning that anybody outdoors could incur "serious health effects," according to Oregon Smoke. (That includes bees, for the honey-industry experts reading.) The cities of Klamath Falls and Bend enjoyed "moderate" pollution, and a several hours' drive northward, Portland residents could breathe easy with "good" air quality. The fires were situated in extremely rugged terrain that hampered firefighting efforts. Approximately 3,000 firefighters were battling the Douglas Complex fires, including the National Guard. About 1,000 were fighting the Big Windy fires. The Douglas Complex was 16 percent contained as of August 6, 2013. Collectively, the two fires had burned nearly 50,000 acres (20,200 hectares). While the fires have not yet destroyed homes, they have forced evacuations and the closure of some roads. Smoke lingered in the valleys, posing a health risk to people. To counter the smoke, the Red Cross distributed 20,000 respiration masks in southern Oregon. On Tuesday, one young firefighter gave up his life after his water truck hit an embankment and rolled over. He was the second person to die struggling to cool down Oregon's fiery summer.